We had been driving for some distance on the left side of the track when suddenly the ground gave way. The left wheels sunk into the earth and with a bump the left wing bored itself into the embankment, and the engine stalled. Claire screamed, her notepad flew out of her hands just missing my head and hitting the windscreen instead, and I swore as Claire landed on top of me, arms wrapped around my neck. After sorting out our arms and legs and disentangling all body parts, we managed to crawl up to the passenger door and clamber out, letting ourselves drop onto the track. From the outside things looked less bad than from the muddled inside. The Land Rover was lying at an angle with the two wheels on the passenger’s side up in the air, but the embankment had prevented it from falling on its side and nothing essential seemed to have been damaged. Then I saw the winch and felt on top of the situation. That winch was my pride. It stuck out in front of the vehicle and such a prominent example of Western technology did not pass unnoticed in Africa. A number of times I had been asked by inquisitive, admiring Africans to explain its use and I had never failed to boast about its near-miraculous qualities. It was powered by the battery and had a strong steel cable wound around the rotor; unwound, the cable was 60 yards long and could take a strain of no less than four tons. I had had no use for it until now, but this was the time to show how well equipped we were. It was just a pity that there was no one around to admire the performance. I climbed up to the roof rack, unlocked the toolkit and got out the 10-foot-long, electric command cable that came with the winch. On one end of the electric cable there was a cylindrical plug that fitted into the box above the winch. I plugged it in then picked up the other end. As Claire did so, the winch’s rotor began to turn with a plaintive, rusty sound, and the heavy hook at the end of the steel cable started coming out of its rest position. I shouldn’t have been concerned about a lack of spectators. I was no more than 10 yards away from the Land Rover, pulling the cable along, when I suddenly noticed that a couple of Africans were watching me; they seemed to have materialised out of thin air. By the time I had chosen a huge tree some 30 yards further, wrapped the steel cable round its trunk and fixed the hook around the cable, another three or four men had popped up. You imagine yourself to be completely alone in the forest, but this is obviously an illusion. If you stop – better even, if something dramatic befalls you – you’re surrounded by people within the hour. Africans seem to have a sixth sense for knowing that something interesting is happening somewhere. As there are extremely few foreigners travelling through the Kasai, a foreign vehicle in trouble is of course a special treat for them. I have never been able to make out, though, why they should be hanging around in dense forests miles away from their villages, but there you are: this is one of the many unresolved mysteries of Africa. As I walked back, I was accosted by one African after another. They all came to shake hands, their teeth shining white in their faces, which were all smiles. Then, without waiting for an answer, they rushed towards the steel cable and took up position along it. They seemed to have taken stock of the situation with one look. A cable was obviously meant for pulling and here they were, ready to lend a helping hand, happy to pull the unfortunate vehicle out. And without further ado they set to it with all their strength. I climbed inside the cabin via the passenger door, started the engine, switched to four-wheel-drive, high-gear mode, stuck up my thumb to signal to Claire to press the button and slipped the stick into first gear. And yes, yes! It happened! The Land Rover jerked into action, scraping the embankment while crawling forward inch by inch, slowly but surely. Another 5 yards and we would be out of this hole and safely back on the road. The wonders of Western technology! The Africans were sure to be greatly impressed by this! 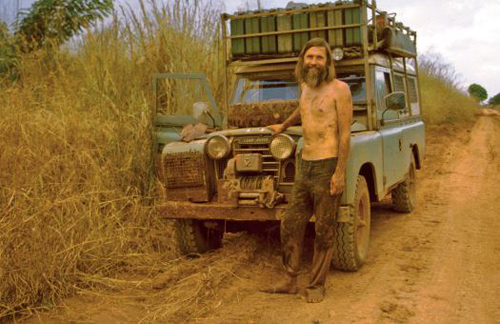 The Land Rover had shifted a couple of feet when suddenly the forward movement stopped. I revved like mad but nothing happened. Claire must have stopped pressing the button. As an answer she held up the electric cable. At the end there was no longer the cylindrical plug that had gone into the winch box. Instead, three thin ends of broken wire stuck out of the black protective lining. I was out of the cabin in no time, staring at Claire in disbelief. ‘How could you do such a thing?’ I shouted. Then I realised what had happened. One fellow had come out of the forest well after the others and, finding the places along the big cable occupied, he must have caught hold of what he considered to be a small cable, thinking, aha, this is a special cable for me. He must have given it a good jerk and pulled out all the connections. I suddenly lost my temper and yelled, ‘Who is the idiot who’s done this?’ When he heard this, one of the men turned on his heels and disappeared into the forest like a hare. A great tumult now ensued and as I tried to fix the problem, the Africans began to press in, looking over my shoulders to see what I was doing. The problem was not as simple as I had thought. There were three wires, a red one, a black one and a blue one, but there were four holes in the cylindrical plug! I made a quick calculation: this amounted to no less than twenty-four possible combinations, but there was nothing else I could do and I set to work while a cacophony of voices was going on around me. I pushed each wire at random into a hole and pressed the contact button. Nothing happened. I tried a second combination, then a third one. By the time I got to the fifth combination so many people were looking over my shoulder and pushing me that I had forgotten which combinations I had already tried out. I started again, but the situation was completely hopeless. I was incapable of concentrating and after a while I gave up, pushed through the crowd and sank down by the side of the track. The Africans had become ever more numerous – there were also women and children among them by now – and the ones who had seen it all were explaining everything that had happened to the newcomers. A great deal of talking was going on in shrill excited voices, accompanied by telling gestures and interrupted by great whoops of merriment and the slapping of thighs as some of the men exploded in loud laughter. What unexpected fun this was! What news to relate in all the villages deep in the forest. This really made their day! As I was sitting there amongst the trees at the side of the track, staring at the scene with empty eyes, I was overcome by the deep realisation that I had fallen into a sort of parallel world. I had been told that Africans had an uncanny propensity for going straight to the weakest point and were capable of undoing the most carefully conceived plans. I had not believed it at the time, but now I had been outmanoeuvred in the blink of an eye by an innocent African hand. More than anything, there was a sense of total defeat. When we had set out four months before to study the problems of development, I had been sure that Western technology was part of the solution. I looked at the winch I had been showing to everyone with such pride. There’s our Western technology, I thought bitterly: a winch with a steel cable that has the potential of pulling four tons! And there it was, this steel cable, hanging taut. 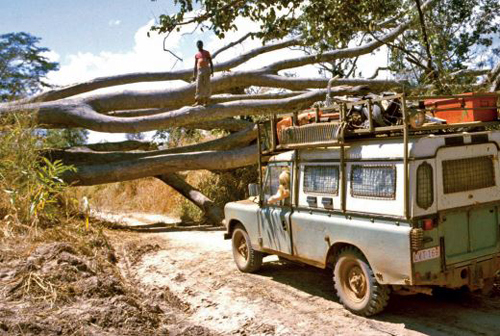 And our Land Rover – that other technological wonder – was not only stuck in a hole but also tied to a giant of the forest, and it could be moved neither forward nor backward. Western technology in Africa! Claire was sitting next to me, still holding onto the command cable with its three broken wires sticking out of the plastic lining, while I kept shaking my head. Here we were, somewhere in the middle of Africa, with trees towering above and a crowd of merry Africans milling around us. What are we doing here? I couldn’t help wondering. Why the hell had I ever wanted to come to Africa? When you’re stuck in Africa it’s no good moaning; neither should you despair. Sooner, but more often later, help will arrive. All you need is patience. About two hours later, we were shaken out of our stupor by a deep rumbling sound further down the track. ‘Camion, Missié!’ Lorry, Mister! shouted the Africans, all excited. More fun was coming their way. What a day! And indeed, a few minutes later, a blundering lorry appeared, lumbering over the potholes of that dreadful track, piled high with heavy bags and lying on top of them, clinging on for dear life, were a number of Africans. As it came to where the crowd blocked the track, the lorry shuddered to a halt and the driver got out, visibly annoyed. A lorry driver is an important man in this part of the world and everyone pressed close to him. They all began talking at once, while a few fingers pointed accusingly at us. The man nodded, pushed the people nearest to him out of the way and turned to me. The man now strode towards the cable, clearly intending to judge for himself. He tried to pull it, but it was so taut that he was unable to move it. ‘Hmm …’ he said with the air of an inspector who is not satisfied, and began to follow the cable all the way to where it was slung around the tree, with me trailing at a respectful 3 feet and the rest of the company even further behind. When he reached the forest giant, the lorry driver began to scratch his head. The cable had cut into the bark and even into the wood as it had tightened when the Land Rover moved. The man stood there scratching his head for a long while. Then, suddenly, his eyes lit up. ‘We cut tree!’ he exclaimed. I stared in disbelief at the mighty forest giant, which had a diameter of two to three feet, but as the lorry driver shot into action and ordered the passengers to bring their machetes I had to admit the soundness of his reasoning. We couldn’t possibly detach the steel cable from the winch – there was still some 30 yards rolled up around the axis of the rotor – but clearly, if they cut down the tree we would be able to pull the end of the cable over the stump and free it that way. The strongest men now set to work chopping at the tree and soon wood splinters were flying in all directions. I wanted to take part in the action and motioned to one of the men to give me his machete, but I made little headway and after a few minutes my arms started aching. This was really heavy work and I handed back the machete. The tree resisted for maybe half an hour. Then, suddenly, the forest giant began to lean over with a great cracking sound, making the men scatter in panic. It tilted ever more rapidly while the branches of nearby trees snapped as if they had been matchsticks, and then the giant came down with a great crash while the earth shook beneath our feet. The tree might have fallen in any direction but, of course, it had fallen towards the road and ended up lying directly across it, completely blocking the passage! This is ridiculous, I thought. It’s quite impossible to move a tree like that. But there were many men now and they all rushed forward to obey his orders. I pulled the steel cable off the stump and then, not wanting to stay behind, I too went over to the huge trunk. It was hard to believe but as we set our shoulders under the tree and started heaving all together, little by little, it began to move! I was just thinking how easy everything really had been when suddenly my whole body began to itch: I was being stung almost frantic by tree ants. In Africa it’s not just big animals or snakes you have to look out for; smaller creatures can be much nastier. You can be walking peacefully in the jungle, sublimely unconscious that you are treading upon a caravan of warrior ants concealed by the thick underbrush. And then there are black ants. They make their mud nests in the branches high above the ground and as it happened, the tree was home to a large ants’ nest. Unfortunately, I found myself in the exact spot where the nest was located. In my eagerness to help, I hadn’t noticed that the ants were swarming over the giant tree and that I was pushing against the nest. The ants clearly didn’t like it and within seconds they began a counter-attack and were crawling inside my clothes and all over me. They did this so stealthily that I hadn’t the slightest notion of it until suddenly they all began to bite as if they had been synchronised. As I felt the burning pain of hundreds of little pinchers simultaneously closing in on my flesh, I yelled and began to pull off my clothes as rapidly as possible. Within seconds I was stripped almost naked and began to pick the little biting devils off my skin, all the while jumping madly about. The Africans stopped, surprised to see me hop about wildly. One pointed his thumb at me and I heard him say, ‘Maybe magic tree dance of white man? We dance, too?’ but the lorry driver didn’t want to hear of it and after I had plucked the ants off my body and put on my clothes again, we all continued pushing. A quarter of an hour later, the tree had been moved sufficiently for the lorry to pass and the driver told his passengers to get back onto the sacks. ‘We off now,’ he said to me. ‘Hey, you couldn’t just hook the cable behind the lorry and pull us out?’ I asked quickly. I hooked the cable behind the lorry, ran towards our vehicle, got in and started the engine while the lorry began to move. 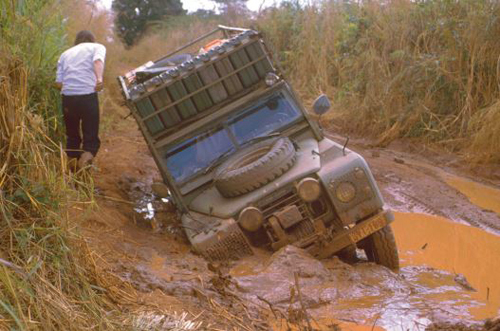 As the cable tightened, the Land Rover was pulled forward with a jerk, and within seconds it was out of the hole and back on the track. I thanked the driver profusely and then the lorry set off with a thundering noise in a cloud of fumes. 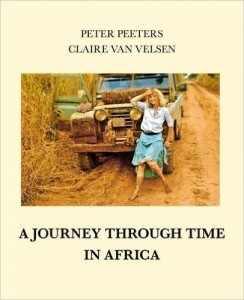 Extracted from their very excellent account of driving down Africa, entitled ‘A Journey Through Time in Africa’, out now on Amazon.